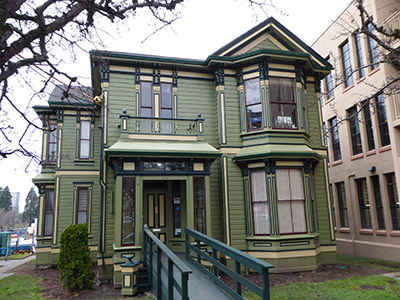 This two-storey Italianate house, built for $5,000, was the mirror-image of the Robson house at 506 Government St. The proximity of the houses allowed mother and daughter to be within easy call of each other. The similarities are in the roof lines, the bays and the front façade. The difference is at the rear of the building: 514 is longer and has a projection on the left side. The vertical aspect of the corner boards and casings are features of the Italianate. The sawn balusters on the balcony balustrade above the front porch, which were missing, have recently been restored by the provincial government. The front left side and the left side of the porch have also been restored (see 1970s Hallmark photo). A pair of stately copper beeches between the two houses remain from the old gardens. The building has housed government offices since 1944. 1885-1943: Joseph Hunter was born in Aberdeen, SCT, and studied civil engineering and surveying. After completing an apprenticeship, Joseph worked in all aspects of railway construction work, and for the government in planning and development, focusing on land improvements such as drainage. He made his way to BC in 1864, via the Panama Railway from Panama City to San Francisco. As this was the time of the American Civil War, Union supporters were suspicious of British immigrants, and Joseph was held in custody for a time before being allowed to continue via steamer to Victoria. He then worked in the Cariboo as a surveyor and miner for seven years. He earned a reputation for settling mining claim disputes, and after Confederation in 1871 he was one of three elected to represent the Cariboo in the BC Legislature. He remained 16 years, four as chair of the Committee of Supply and Deputy Speaker. He also served as a Victoria alderman in 1891-92. At some point Joseph joined the Canadian Institute of Civil Engineers. In 1872 for the CPR, he surveyed the site of Seymour Narrows Bridge. Throughout the 1870s Joseph surveyed various portions of BC, including Vancouver Island for the CPR. In 1877 for the dominion government, he surveyed a boundary line along the Stikine River between BC and Alaska in accordance with the terms of the Treaty of Saint Petersburg of 1825 aka the Anglo-Russian Convention of 1825. In 1883, Joseph began his 35-year career with the E&N Railway on Vancouver Island, and built this house shortly after. He held various positions, including vice-president, general superintendent and chief engineer. He surveyed the route and designed all the structures, and was responsible for the planning and building of Ladysmith’s water system. In 1898, he took a leave of absence from the E&N to design and build a bridge across the Quesnel River at Quesnel Lake. Joseph later described this project as his most professionally satisfying piece of work. A long-time Freemason, Joseph was made a Master Mason in Cariboo Lodge No. 4, AF&AM, in Barkerville, BC, in 1869. He joined Vancouver and Quadra Lodge No. 2 in 1879, being elected an honorary member in 1932. After 54 years of service to the province, Joseph retired from public and professional life. He died in 1935 at 92. Frances “Fannie” Robson, daughter of Hon. John and Susan Robson (506 Government St), was born in Ontario and came to BC as a child in the 1850s. She married Hunter in Victoria in 1878, but was living in New Westminster with her parents in 1881, probably because of her husband’s work. Their son, Joseph Douglas Hunter, served as a city alderman and MLA for Victoria from 1937-41. Fannie was actively involved in local charitable groups. She loved gardening, which she continued to do while living in this house until shortly before her death in 1944. She was 86. 1944-2018+: In 2003 the BC Buildings Corporation won a Hallmark Society Award for their restoration of this house.